Disinfectants in the water industry; how effective are they? The majority of businesses are continuously trying to improve the way they run their organisations; tightening up processes. Introducing more cost effective solutions or technologies to existing procedures can play a key role as part of these improvements. Implementing new technologies into an existing company can be a big decision, especially if things are actually working ‘OK’– why fix something when it’s not broken, right? Do the water disinfection methods applied in your business need reviewed? Could there be potential for a new, more sustainable solution? We want to ensure that you are armed with all the information you need to make the right decisions for your company. 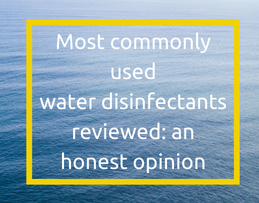 In this article we are going to look at six disinfectants in the water industry and how effective they are in comparison to each other. All disinfectants are the same, right? Every pathogen (a bacterium, virus, or other microorganism that can cause disease) has a variable resilience so the disinfectants used to combat them needs to be strong enough to ‘kill’ or ‘inactivate’ the pathogen. Each one of these disinfectants comes with advantages and disadvantages, and certain disinfectants may be more suitable for a particular application than its counterpart. 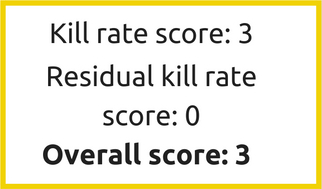 The ‘kill rate’ of each substance indicates how quickly after contact the disinfectant renders the pathogen harmless. Some disinfectants leave a useful persistent disinfecting affect, ‘killing’ pathogens even after the application process is complete. This is called ‘Residual Kill’. Without a residual kill pathogens can rapidly reinfect the water and cause a danger to consumers. How effective is my disinfectant? In this video, we are going to compare six commonly used disinfectants, highlighting some of their key advantages and disadvantages. What are the advantages and disadvantages with using Sodium Hypochlorite as a water disinfectant? As with chlorine gas, it is relatively cheap and can economically disinfect small to large amounts of water. Although safer to handle than chlorine gas, NaOCl is still a hazardous and corrosive substance. At the standard supplied concentration (14%), storage and handling of NaOCl requires process safety procedures and containment. This is to avoid exposure to workers and the environment and to prevent loss of potency through exposure to air, which causes it to deteriorate. What are the advantages and disadvantages with using Ozone (Trioxygen or O3) as a water disinfectant? What are the advantages and disadvantages with using Chloramine as a water disinfectant? Chloramine is one of the weaker disinfectants in this comparison but is more stable, and thus provides longer lasting residual disinfectant which can be an advantage for distribution systems. Like other chlorine types it is relatively inexpensive and simple to use. On-site generation of monochloramine requires chlorine gas or hypochlorite, which means that the safety precautions associated with chlorine apply. What are the advantages and disadvantages with using Chlorine Dioxide (ClO2) as a water disinfectant? It is a more effective disinfectant than chlorine having an efficacious effect on bacteria, viruses and cysts, but is not as strong an oxidant as free chlorine. What are the advantages and disadvantages with using Calcuim Hypochlorite as a water disinfectant? Calcium Hypochlorite has excellent stability when kept in dry storage, maintaining its potency over time. This compound is relatively stable, is similar to sodium hypochlorite in disinfection properties and has greater available chlorine than sodium hypochlorite (liquid bleach). Because the chemistry is so similar to chlorine gas and NaOCl (“liquid chlorine”), this method offers no disinfection efficiency advantages (i.e., Giardia and Cryptosporidium kill rates) nor disinfection by-product advantages. It is corrosive and hygroscopic (i.e., readily absorbs moisture from the air), reacting slowly with moisture in the air to form chlorine gas if not stored in air-tight containers. What are the advantages and disadvantages with using ESOL Electrolyzed water as a water disinfectant? ESOL™ electrolyzed water process results in THM (trihalomethane) levels considerably lower than those produced by treatment with chlorine gas. Electrolyzed water is NOT new. Electrolyzed water was discovered back in 1834 but the concept was underdeveloped until after World War Two when the Russians and Japanese started carrying out studies in the 1950’s. The technology is now studied worldwide and has been scientifically accepted as an excellent method of disinfecting. In the water disinfection process, electrolyzed water has been successfully introduced in private water supplies, outperforming traditional disinfectants such as Chlorine, without the associated drawbacks. Bridge Biotechnology manufactures ESOL™ generators and then you, the customer, have complete control over the production and application of the electrolyzed water. Each generator is built to a tried and tested specification however; ESOL™ electrolyzed water can be made to different oxidizing strengths by adjusting the cell current of each generator using a simple to use control panel. Due the plethora of problems that ESOL™ can solve means that there needs to be various options for the application of the liquid. Related content: How can ESOL electrolyzed water be applied? So what things could be holding you back from making the change? Would you like to introduce an environmentally alternative to chlorine into your business? Are you ready to take the next step to improve your disinfection process? Likewise; has this article left you with other questions? I have read with interest your blog on ESOL and I have to say that you have highlighted the universal benefits of the use of ‘ESOL’ so much so that every reader would be encouraged to substitute your product for the shelf full of the currently available ‘anti bacterial ‘ cleaners. My main questions are, in what packaging is ESOL marketed? Where can I buy ESOL and at what price? Does it come in a spray bottle and if so what size? Hey George, thank you for your interest in ESOL. In answer to your questions; ESOL is generated on site here at our premises in Dunfermline and packaged in recycled plastic containers. We ship the ESOL in recycled cardboard boxes using our shredded paper in place of bubble wrap – nothing goes to waste 🙂 ESOL is available in 750ml spray bottles, 5 litre bottles and 25 Litres jerry cans, all made from the same recycled plastic. ESOL will be available online from the end of October 2018. In the meantime, we have added your details to our mailing list and will keep you up to date with news on our product. Have a great day George!